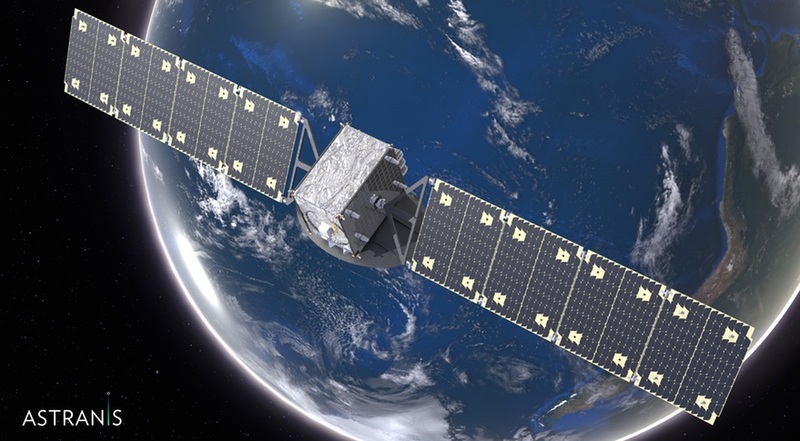 SAN FRANCISCO — Astranis, a startup developing geostationary satellites to offer broadband internet access, announced plans June 14 to equip its MicroGEO spacecraft with Bradford of the Netherland’s high performance green ECAPS thrusters. Under the agreement, Astranis will purchase eight ECAPS thrusters for each MicroGEO satellite. The initial order covers as many as 12 spacecraft. In addition, the agreement calls for Bradford’s Space Group to supply the Astranis constellation with electrical propulsion feed systems and a set of eight Cosine Sun Sensors for attitude control. Astranis plans to launch dozens of 300-kilogram satellites to provide capacity of up to 10 gigabits per second to underserved communities. In March, the San Francisco-based startup announced it raised $18 million in Series A funding. The deal marks the introduction of ECAPS, which stands for Ecological Advanced Propulsion Systems, to geostationary orbit, which is dominated by large telecommunications satellites with hydrazine-fueled thrusters. ECAPS thrusters burn LMP-103S, a storable liquid monopropellant that blends ammonium dinitramide with water, ammonia and methanol. Because ECAPS is less toxic than conventional propellants, Astranis will be able to fuel satellites in its factory rather than at the launch site, Fichtenbaum said. “Hydrazine thrusters cannot be fueled at the factory because of toxicity, handling and transportation [requirements], but the ECAPS propellant can,” he added. The Astranis agreement is one of the largest orders to date for ECAPS. Bradford also supplies ECAPS thrusters for San Francisco-based Planet’s SkySat Earth imaging constellation, Fichtenbaum said. A dozen satellites have used ECAPS propulsion systems in orbit and several more, including imaging satellites and U.S. government spacecraft, slated for launch later this year will employ the technology, according to the Bradford announcement. Bradford Holding Company Ltd., which owns Bradford, purchased ECAPS AB from Swedish Space Corp. in July 2017. Bradford builds spacecraft control and components as well as micro-gravity facilities for the space station.